Halloween is the perfect time to get creative in the kitchen and a great excuse to make treats that look ghoulish, yet taste delicious. 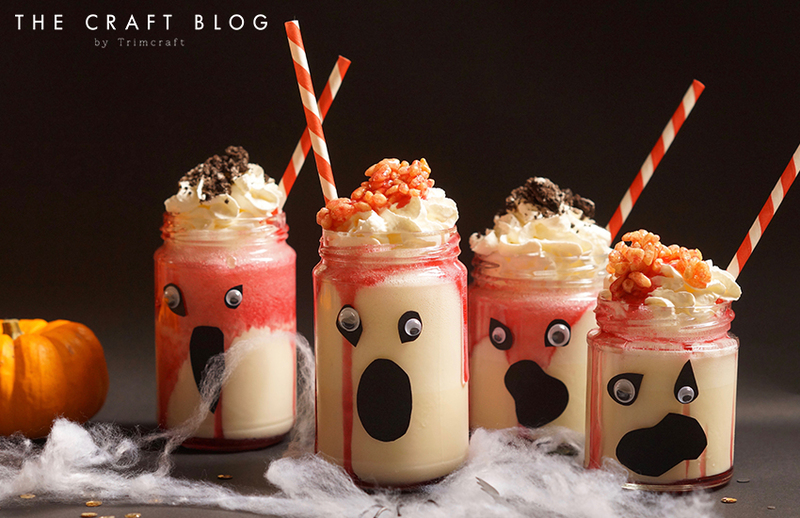 These Spooky Vanilla and raspberry freakshakes are no exception, complete with crispy 'brains' and raspberry 'blood' they really are a terrifying treat! 1. Begin by decorating the glasses. Roughly cut two wonky eyes and a mouth out of Dovecraft Black card per glass, the crazier the shape the more effective the ghostly silhouette will be. Stick these onto the front of each glass with a little Perma Fix tape. Next remove the backing from the wiggley eyes and place these onto each eye. 2. To make the Oreo 'dirt' place the oreos into a mixing bowl and use the end of a rolling pin to crush the biscuits to a rough crumb. 3. To make the rice crispie 'brains' place the rice crispies into a mixing bowl and squirt over the raspberry sauce. Mix together with a spoon so all the cereal is well coated and 'brain like'. 4. Remove the ice cream from the freezer 10 minutes before you wish to make the milkshake and allow to soften so it's a little easier to scoop. 5. Place the milk and the ice cream into a large mixing bowl or food processor then gently whisk or blend the two together until all the ice cream has melted and the mixture is frothy. 6. Carefully squirt the raspberry sauce around the inside rim of each glass, tilt the glass to the side so the sauce drips down the inside of the glass. 7. Pour the milkshake into each glass, top with whipped cream then layer the 'dirt' and 'brains' on top of the cream to complete the ghoulish look. • Squirting the sauce inside the glass isn't essential, but will eliminate, or at least minimise, sticky fingers and mess. • For a more tropical take on the milkshake or for the more adventurous, replace the milk with coconut milk and follow the above method. • Equally, create different milkshake flavours by replacing the vanilla ice cream with chocolate, raspberry ripple or indeed any flavour you fancy. • The jam jars with black card eyes and mouth make excellent low cost spooky Halloween candle holders too! Elle’s haunting creation is seriously milkshake ghouls! (sorry not sorry!) Her recipe is super easy to whip together and would be brilliant for making at a Halloween party or to enjoy in the comfort of your home while watching a scary movie! How will you use Elle’s Halloween milkshake recipe? We’d LOVE to see, so don’t forget to #Trimcraft and @elle_jane_ when uploading to social media and to share your yummy makes in the Inspiration area. Awesome, I really love these - they look spookylicious!